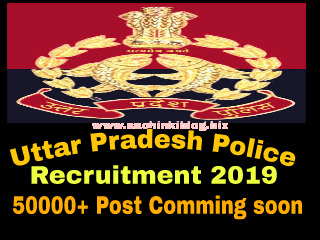 Uttar Pradesh Police 50000+ Vacancy Coming soon, UP police 56880 Vacancy, Up police Bharti details, Join Up police Bharti 50000+ Post, Join UP police, up police Bharti details. Uttar Pradesh police : Police me bharti hone ke sapne sajone yuvaon ke liye apne jooton ko karane ka samaya aa gya hai. CM. Yogi Adityanath ne vijaya dashmi ke mauke par 50000+ posto par bharti karane ki Ghosna ki hai. Jisme sipahi ke 51216 post Samil hai iske alawa Fireman , Bandirakshak , aur Ghurswar (Horse rider) Police ke pado par bhartiya honi hai.. Application 1 November se start honge aur Written Exam January 2019 Tak hoga. Aur result July 2019 tak ayega. ●For All male :- 4.8 Km in 25 Minutes. After comment we will give your reply soon as possible ! Please Subscribe us via email for further informations.